Sodium valproate is licensed in the EU for treating generalised, partial or other forms of epilepsy. It has also been used to treat bipolar disorder and to prevent migraine. In February of this year, the European Medicines Agency recommended that sodium valproate should not be used during pregnancy unless no other effective treatment is available, and that it must not be used in women able to have children, unless the conditions of a pregnancy prevention programme are met.1 These measures to protect women and their children are welcome, but we argue that they should have been instituted several years ago, as the evidence was clear as far back as 1990 that there were risks of congenital malformations in women exposed to valproate. In 1992, Antman and colleagues used cumulative meta-analysis to show that expert recommendations often lagged behind pooled estimates of clinical trials.2 In a cumulative meta-analysis, the combined result is summarised by adding each new clinical trial result to the previous. This can be a useful technique for assessing both benefits and harms, allowing interpretation of what was known and when it emerged. In 2015, Tanoshima et al performed a systematic review of 59 cohort studies published between 1983 and 2014, using cumulative meta-analysis. We used their analysis (see figure 1 to interpret signals of valproate-associated major congenital malformations and to determine when they emerged.3 In 1990, Hunter and Allen published an assessment of the risk of congenital malformations among 88 women with epilepsy using valproate.4 The results were not significant. However, when they were added to the cumulative meta-analysis of the previous seven studies (bringing the number of women studied to 846), a statistically significant effect for an increased risk of major congenital malformations emerged, with a cumulative risk ratio (RR) of 2.60 (95% CI 1.24 to 5.44; p=0.01). A doubling of risk is an important measure, as it provides sufficient certainty in law to establish causation.5 In US and UK courts of law, a doubling of risk is accepted as a minimum threshold for determining specific causation. With the addition of more studies between 1990 and 2014, the summary RR varied between 1.79 and 2.60. However, the signal that the risk with valproate doubled was clearly established in 2004 when the results from Wide et al (the 25th study to be analysed) were added. 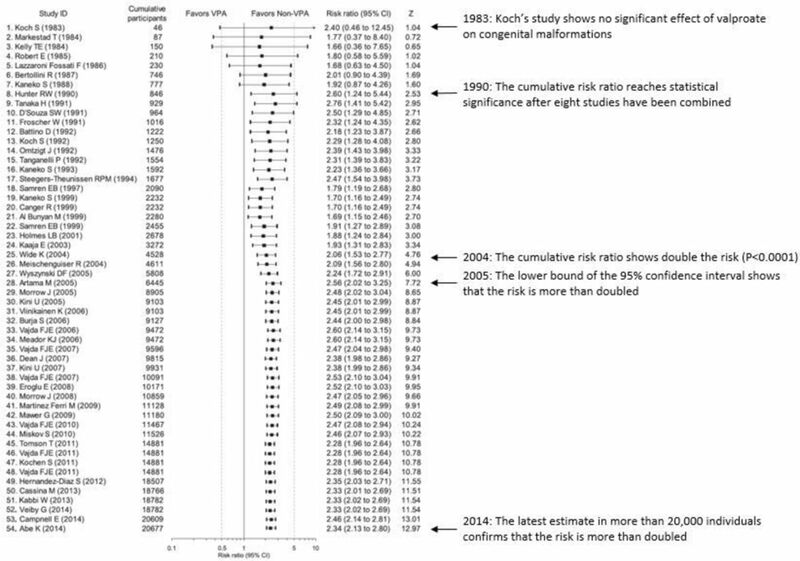 The cumulative meta-analysis now included 4538 patients, and the result showed a permanent cumulative doubling of risk (RR 2.06; 95% CI 1.53 to 2.77; p<0.0001). An even more convincing estimate was reached in the following year when even the lower bound of the CI was greater than 2 (see figure 1). Despite these results, sodium valproate continued to be used widely. The signal of congenital malformations provided by the cumulative evidence in 1990 showed that there were problems, and by 2005 there could be no doubts whatsoever about the association. Many individual studies provided uncertain effects, which will have led to delays and misunderstandings over the interpretation of the harms. However, there was also evidence of lower risks with other antiepileptic drugs. Furthermore, the risk of neural tube defects was already apparent in 1992, when 954 women were included in the cumulative meta-analysis (RR 4.62; 95% CI 1.46 to 14.62; p<0.005).3 From that time, women taking valproate should have been given routine folic acid supplements, despite conflicting reports of the effect of valproate on folic acid concentrations.6 The lower boundary of the CI exceeded 2.0, with the publication of the eighth study in 1992 (cumulative rate ratio 6.99; 95% CI 2.68 to 18.20; p<0.001). Teratogenicity of valproate in animals was first reported in the 1970s, significant signals in humans were present from 1990 onwards and by 2005 the evidence for major congenital malformations was overwhelming. Since then, the estimated RR and its CIs have remained stable. The latest estimate shows a more than doubling of the risk (RR 2.24, 95% CI 2.13 to 2.80) for congenital malformations, based on an analysis of over 20 000 subjects. In 2014, the European Medicines Agency recommended strengthening the restrictions on the use of valproate in pregnancy and women of childbearing potential,9 and in 2018 further measures were required to avoid unnecessary valproate exposure.10 However, we consider that regulators, governments, drug companies, journal editors, prescribers and systematic reviewers have all acted too late. We, therefore, consider that from 1990 individuals should have been offered the opportunity to switch to treatments with lower risks, where they existed, and given minimum effective doses of valproate if alternative treatments were not available or advisable. In the intervening years, many women’s children will have been harmed. Manufacturers and regulators should be responsible for ensuring that cumulative analyses are carried out as part of postmarketing risk management plans. We thank those whose children have suffered from valproate malformations, including the Organisation for Anti-Convulsant Syndrome, who made us aware again of the problems and provided the impetus for this article. European Medicines Agency. Human medicines. Valproate and related substances. http://www.ema.europa.eu/ema/index.jsp?curl=pages/medicines/human/referrals/Valproate_and_related_substances/human_referral_prac_000066.jsp&mid=WC0b01ac05805c516f (accessed 7 May 2018).
. A comparison of results of meta-analyses of randomized control trials and recommendations of clinical experts. Treatments for myocardial infarction. JAMA 1992;268:240–8. European Medicines Agency. PRAC recommends strengthening the restrictions on the use of valproate in women and girl. http://www.ema.europa.eu/docs/en_GB/document_library/Referrals_document/Valproate_and_related_substances_31/Recommendation_provided_by_Pharmacovigilance_Risk_Assessment_Committee/WC500175214.pdf (accessed 14 May). New measures to avoid valproate exposure in pregnancy endorsed. http://www.ema.europa.eu/ema/index.jsp?curl=pages/medicines/human/referrals/Valproate_and_related_substances/human_referral_prac_000066.jsp&mid=WC0b01ac05805c516f (accessed 14 May). Contributors CH and JKA came up with the idea for the editorial, CH wrote the first draft and both authors had equal input to the final manuscript. Competing interests CH has received expenses and fees for his media work, including BBC Inside Health. He holds grant funding from the NIHR, the NIHR School of Primary Care Research, the NIHR Oxford BRC and WHO. He has provided advice to children who have suffered from valproate malformations, including the Organisation for Anti-Convulsant Syndrome. He has also received income from the publication of a series of toolkit books and is Editor-in-Chief of BMJ Evidence-Based Medicine. He is Director of the Centre for Evidence-Based Medicine (CEBM), which jointly runs the EvidenceLive Conference with the BMJ and the Overdiagnosis Conference with some international partners, which are based on a non-profit model. JKA has written and edited articles and textbooks on adverse drug reactions, including Meyler’s Side Effects of Drugs (16th edition, 2016), its companion volumes the Side Effects of Drugs Annuals, and Stephens’ Detection and Evaluation of Adverse Drug Reactions (6th edition, 2011). He has written legal reports for private individuals and coroners on adverse reactions to drugs, including sodium valproate. He is an Associate Editor of BMJ Evidence-Based Medicine and a member of the CEBM (see above).